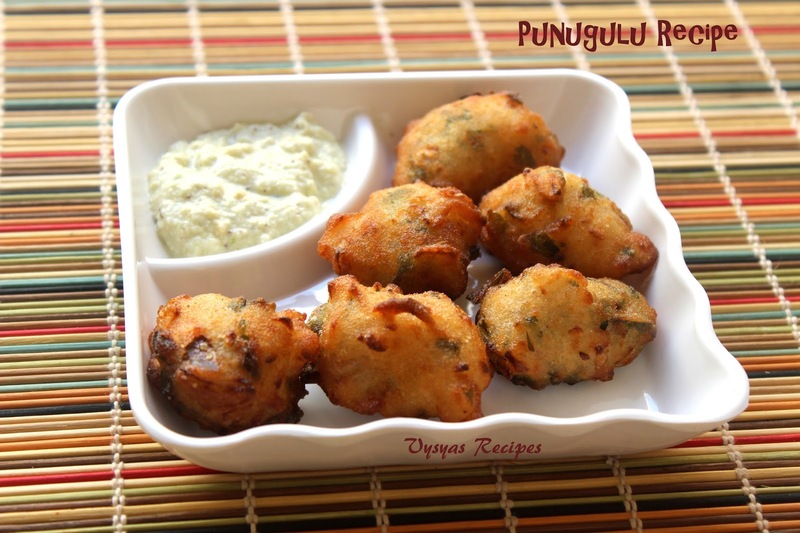 Punugulu is a Popular Andhra deep fried snack, made with fresh idli batter or left over idli batter. if you like sour taste, use left over idli batter.It is usually served as a Evening Snack with hot cup of chaai. It is made during festive occasions like Ugadi,Varalakshmi Vratham,Navratri & diwali at Andhra homes. Punugulu is crisp outside,soft & fluffy Inside with Mild hot & Sour taste.As ugadi is Near by planned to post this crispy snack. Rice flour - 1 - 2 tbsp. Onion (chopped) - 1/2 cup. Chop the onions,Green chillies,curry leaves,Coriander leaves & Ginger finely. Take a Mixing bowl Combine Idli batter, 2 tbsp of Maida, 1 or 2 tbsp of Rice flour, Chopped onions,Green chillies,Curry leaves,Coriander leaves,Ginger & salt. Mix well. The consistency of batter should be thicker. if the batter is runny then add few table spoons of Maida or Rice flour. if the batter is thick, add few table spoons of water. Let the batter be as such for 15 - 20 minutes. Heat the oil in a kadai, when it is hot drop small portion of batter into oil, if it pops up immediately it is an indication that oil is hot.Now keep the flame to Medium. Now shape the batter into round tiny balls with fingers & drop in hot oil. Fry them till it turns crisp & Golden Brown colour. Drain it in kitchen tissue.Cook in batches.Don't over crowd the pan. Serve hot the Pungulu with Coconut Chutney, Allam Pachadi, Peanut chutney or Tomato Chutney. While Making Punugulu for festive Occasions exclude onions. As a variation instead of Maida you can use powdered Poha also. I used fingers to shape the dough, you can use spoon to. if you like sour taste, use 2 - 3 days old idli batter. 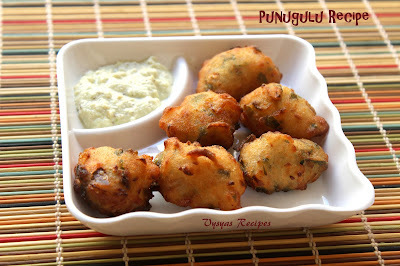 a different & interesting recipe with idli batter. Have also taken up blogging. This is a new recipe for me as well, but looks tempting, as you said crispy from outside and soft from inside.